Thomas Robinson Architects were among the winners at the prestigious Glasgow Institute of Architects 2012 Design Awards. The company saw off competition from 57 other entries to lift the Award for Sustainable Architecture for their work to design eco-friendly luxury holiday properties from the derelict Curlew Cottage and adjoining Old Dairy at East Cambusmoon Farm in Gartocharn. The judging panel recognised the meticulous work that had gone into creating exceptional levels of comfort while conserving energy and using sustainable materials in the properties, which are located in the heart of Loch Lomond and the Trossachs National Park. "The client's commitment to environmental responsibility and renewable energy has been well matched by the architects' commitment to the project. Even the chickens populating the garden looked contented!" Tom Robinson, founding director of Thomas Robinson Architects, explained they had helped retain the character of the former farm buildings by re-using existing roof slates and red sandstone where possible. Modern materials such as larch cladding were introduced in the new-build section. Energy efficiency was also high on the client's priorities and he added: "The aim was to design a development that operates to high sustainable principles. Both cottages use a highly-insulated and airtight timber frame to keep draughts out and the heat in. 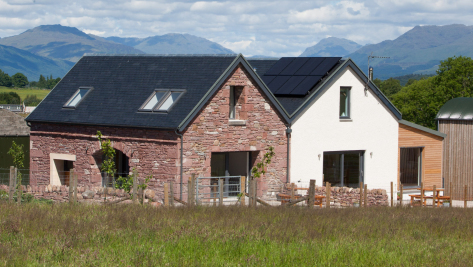 A ground-source heat pump and solar roof panels ensure the properties produce most of their energy on site. A heat recovery system, underfloor heating and high-efficiency stoves provide back-up heat sources. "The enhancement of these existing buildings by bringing them back to a good state of repair and adopting high design standards assists in the desire to raise design quality and ensures the continued use of traditional farm buildings in the National Park."